Liana Romulo began her yoga journey in the Philippines, her birthplace. She has been a yoga practitioner since 2003 and a student of pranayama (breath work) since 2006. Her principal teachers, Richard Freeman and Mary Taylor, are for her an enduring source of inspiration and illumination. Liana has completed a number of intensives and yoga-training courses over the years with Richard and Mary, John Scott, Paul Dallaghan, and the Kaivalyadham Yoga Institute in India. She follows the pranayama lineage of Swami Kuvalayananda, founder of Kaivalyadham. She has completed close to a thousand hours’ training directly under O.P. Tiwari, and received his blessing to share the pranayama practice with others in 2012. As a certified provider of TRE ® – a healing modality designed to alleviate stress and address trauma – Liana helps others release deeply ingrained patterns of emotional, mental, and physical holding. She’s also an avid scuba diver, an amateur photographer, a former New York City book editor, and a published writer of children’s books. In 2008 Carla Lloren stumbled upon yoga and quickly grew to appreciate its therapeutic effects. Realizing that the practice was a great way to alleviate stress from a fast-paced lifestyle, she has been practicing ever since and has explored various styles of yoga: Sivananda, Iyengar, and Ashtanga. She committed to the Ashtanga Vinyasa system in 2010. In 2015 Carla received her 200-hour teacher training certification under the guidance of Paul Dallaghan at the Centered Yoga Training Institute in Koh Samui, Thailand. It was also during this time that she gained a deeper appreciation for pranayama. Carla is committed to the path of yoga and sees it as a method to gain glimpses of the ‘Self’ by exploring the nature of the mind through the body and the breath. She considers teaching as a service to others who might also be on the path to wellness. 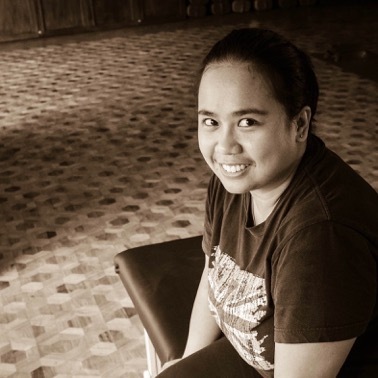 Faith Punzalan has been practicing Osteopathy since 2012 and Physical Therapy since 2006. She's got an intuitive gift for healing on top of an insatiable appetite for learning. The healing modalities in her toolkit include Craniosacral Therapy, Lymphatic Drainage Therapy, Visceral Manipulation, and Spinal Manipulation and Mobilization. In the coming months she will also be trained in Dynamic Neuromuscular Stabilization (DNS), a hands-on rehabilitation technique based on principles of developmental kinesiology (how babies grow and learn to move) as applied toward the neurophysiological aspects of the adult locomotion system.